Day 17 of our month long love-fest of leather. IT IS FUN TO MIX AND MATCH LEATHER WITH OTHER MATERIALS. off each other feels exciting and bring new life to designs. Leather makes it easy to mix and match and find contrasting or complimentary materials Consider adding some leather elements to fabric pieces and vice versa. You and your customers will love the effect and statement. We’ve talked before about the close-knit world of leather and fabric, they can play together so well. 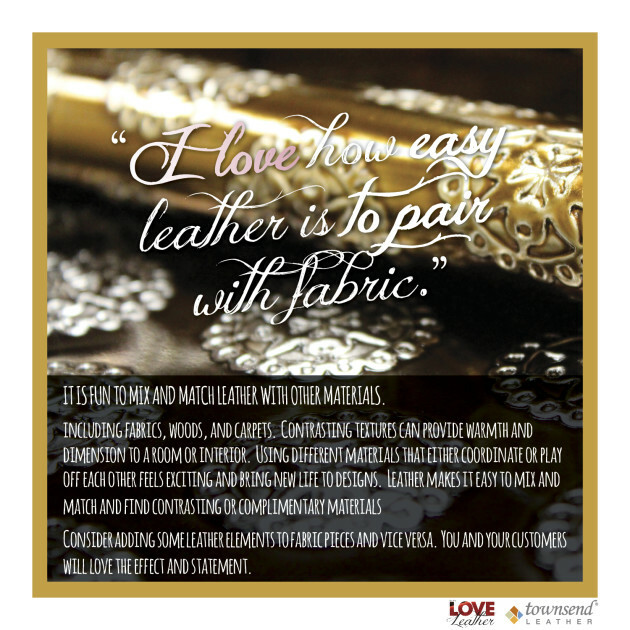 Whether you are looking to perfectly match a specific fabric, Fabric to Leather Customization, or getting inspiration from fabric worlds, Leather and Lace, Fashion-Interiors Cycle leather is so versatile and customize-able you can make it work with any fabric.